Choline, which is a structural element of cell membranes, and acetylcholine, which is known as a neurotransmitter, are both familiar compounds in the field of bioanalysis. Since acetylcholine is biosynthesized in the body from choline, it is possible to estimate the quality of internal activity by monitoring both of these compounds. This article focuses on the SFC analysis of these compounds in a rat cerebrospinal fluid sample by direct injection of the cerebrospinal fluid to the Nexera UC SFC system. Also introduced is automatic extraction and analysis of a cerebrospinal fluid sample impregnated into filter paper, in consideration of convenience and durability for storage and transport, using the Nexera UC online SFE-SFC-MS/MS system. A CN column provided favourable separation of choline and acetylcholine in SFC-MS/MS analysis. Good linearity of calibration curve, retention time and peak area repeatability were obtained using standard samples. The methods were applied for those compounds in the cerebrospinal fluid sample. 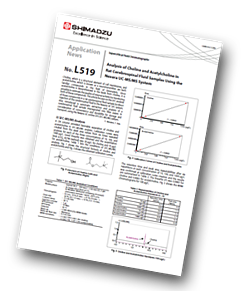 Online SFE-SFC analysis of choline and acetylcholine in a cerebrospinal fluid sample is also shown. A sample was prepared by impregnating cerebrospinal fluid sample into filter paper and drying the paper. SFE-SFC-MS/MS analysis was then performed on the sample. The convenience of this method is gaining attention not only because of ease of sample handling but also because of improved miscibility concerns between a mobile phase of low polar supercritical carbon dioxide and an aqueous sample solvent containing a biological sample.